Welcome to the Davie West Homeowners Association community website. Ours is a wonderful neighborhood of 75 individually built homes located off SW 26th Street and S. Hiatus Road about a mile south of I-595. Established in 1969, Davie West is within the municipal limits of the Town of Davie. Districted public schools are: Fox Trail Elementary, Indian Ridge Middle and Western High School. Our neighborhood is filled with active families who care and desire to make this community a better place to call home and raise their families – where everyone makes it a point to get to know each other. 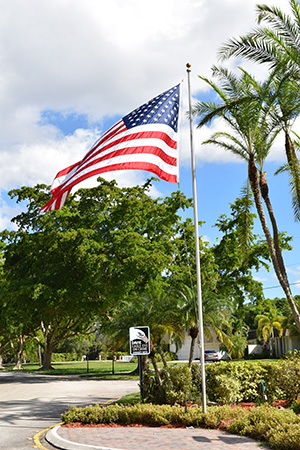 This website has been created to provide Davie West residents with neighborhood information. Here you will find facts, contact numbers and other useful resources. We welcome you home and invite you to become an active and participating member of our unique community. Building of fences, changes to the footprint of your home such as additions and new driveways must have a permit and be approved by the Homeowners Association. Please refer to the “Deed Restrictions” bar for more detailed information and the community By Laws. * Garbage days are Wednesdays & Saturday and must be put in the designated green garbage cans provided by Waste Management. * Recycle is every Saturday and must be put in the designated tan garbage cans provided by Waste Management. * Bulk pickup is the second “full week” Saturday of every month *size restrictions apply and any appliance must have doors secured shut. Whats left of 2018 bulk dates: May 12, June 9, July 7, Aug 11, Sept 8, Oct 6, Nov 10 & Dec 18. Size of bulk on curb: no larger than a car, no glass, batteries, dangerous items, etc. If in doubt call Waste Mgmt. By law, all pet owners must pick up after their pets and keep them on a leash unless they are properly secured in the yard. The Davie West Homeowners Association is a voluntary group of homeowners with the goal of making living here a wonderful experience. Please consider volunteering for a role on the Board or volunteering to help with events to ensure we remain one of the best neighborhoods in Davie. Copyright © 2019	Davie West Homeowner's Association. All rights reserved.